When we decorate our homes, in addition to the basics, we often look for unique items that clues visitors into our personality. My living room is a clayish orange and that usually gets a wow reaction. My wine cabinet is pretty cool and I have some photographs from the very talented photographer, Hassan Kinley hanging over it and that set up in the welcome room really invites guests into our home. During a visit to the fragrance emporium, Aedes de Venustas, I discovered Diptyque’s scented ovals and I knew I found that unique piece. To commemorate its 50th anniversary, Diptyque launched 34 Boulevard Saint Germain, which is the address of its first boutique in Paris and the scent of its store. The launch collection consists of a 50ml eau de toilette, body and home products, which include a candle and the scented ovals. As its packaging states, “The scented oval by Diptyque is comprised of a ceramic ring containing highly fragrant hand-dripped hardened wax.” Its scent bursts through the packaging and it’s an awesome accessory to scent small offices and closets. 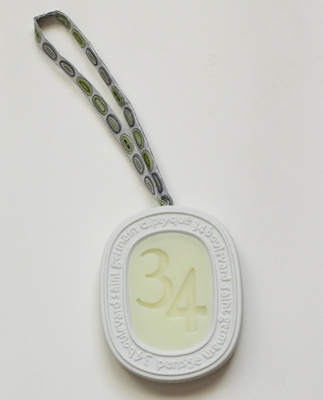 34 Boulevard Saint Germain notes include green leaves, citrus, cassis, spices, tuberose, iris, rose, geranium, violet, woods, balsams and eucalyptus. It’s been hanging in my office next to a framed picture of Dizzy Gillespie and its scent beautifully fills the space. For those that can’t burn candles at work or just want to add something different to their scented mix, this is it. I’m told it should last about three months but even if it doesn’t, for the modest price tag of $50, it’s just right for my fragrant personality. This entry was posted in Product review and tagged Aedes de Venustas, Diptyque, diptyque scented ovals, Home Fragrances, Scented Ovals, Unique gifts. Bookmark the permalink. How cool is that!? I’m glad you mentioned this or it would have slid by unnoticed. I’m glad I noticed it as well. Such a unique trinket. Victoria, it make a very unique gift. I love it. I plan on buying other scents. Unique indeed. This would be great for keeping this fragrant while traveling as well. Since the outer shell is made of porcelain, I don’t see how it can be refilled. Such a waste. Will the scent really last about 3 mths or more if you hang it in the closet? I beg to differ. I don’t reuse the vessels candles come in or even think about refilling them. My scented oval definitely lasted a while.